Just How Small Can DMLS Print? 3D metal printing is in its element when it comes to production parts at micro scales. While machine development is focusing on creating DMLS paltforms that can print parts over 14″, Direct Metal Laser Sintering (DMLS), current DMLS capabilities are perfect for small, complex parts. 3D printing enables i3D MFG™ to deliver integral tiny, complex parts in Aluminum, Titanium, Maraging Steel, Stainless Steel and Inconel to Aerospace, Prosthetics, Medical Devise, UAV/UAS, Rocket/Spacecraft, Oil & Gas, Firearms, and Recreational Gear industries. For the part shown, a .015″ (15 thousandths of an inch) high latticed geometry was grown in Maraging (tool) steel. Machining the tiny part out of such a tough metal was expensive and problematic. Since DMLS build parts from mirco powder layers, laser melted together one micro layer at a time, 3D printing precise micro geometries is not much more difficult than printing large bulky parts – in fact, the larger the mass on a DMLS machine, the greater the risk of delamination and failed builds. Is DMLS Metal Powder the Real Thing? The short answer is YES. The longer version is, that DMLS powder performance is highly dependent on the expertise of the machine operator and 3D engineering design. i3D™ Manufacturing specializes in DMLS powder performance and applications. As the EOS Material Process Applications (MPA) partner, i3D™ is proactive in using open parameter sets on its machines to achieve varying densities, analyze layer performance, and optimize part quality. Densities can range to nearly 100% allowing for post process of DMLS metal parts in all of the same ways machined and cast parts are treated. Uniform particle size and shape is the ultimate goal. Making sure that your DMLS provider knows the atomization process and resulting powder quality of their materials is a critical question. Read about AMA’s process. Ask the provider how they sieve their powders between builds. It makes a big difference in the quality of the part. Also ask about the material change-over procedures and powder storage conditions. Keep in mind, junk in, junk out. Below is a list of stock metal powders i3D™ uses. We also work with custom DMLS powder creation and applications such as Monel K 500 and Ti 6-2-4-2. Aluminum (AlSi12) – better flow through the machine and very little residual Si. Great for thermal properties and weight considerations. Equivalent to 6061 billet. Fastest building and most cost effective material. Titanium (Ti64) – i3D™ mastered DMLS titanium and recommends it for weight reduction and strength considerations. No waste 3D printing makes Titanium a highly cost effective DMLS material. Inconel 718 – Widely used for aerospace applications. Highest reflectivity with excellent strength and corrosion resistance. Medium build speed with properties much like steel. Stainless Steel (15-5, 17-4 & 304) – Strong and great corrosion resistance. The one draw back is that steel has a slow build time and is often a less cost effective option. Maraging (tool) Steel – Hardens to 58 HRC after heat treat. Excellent choice for mold tool and production tool needs. Conformal cooling channels manufactured out of 6061 Aluminum open up amazing possibilities for heat sink applications. 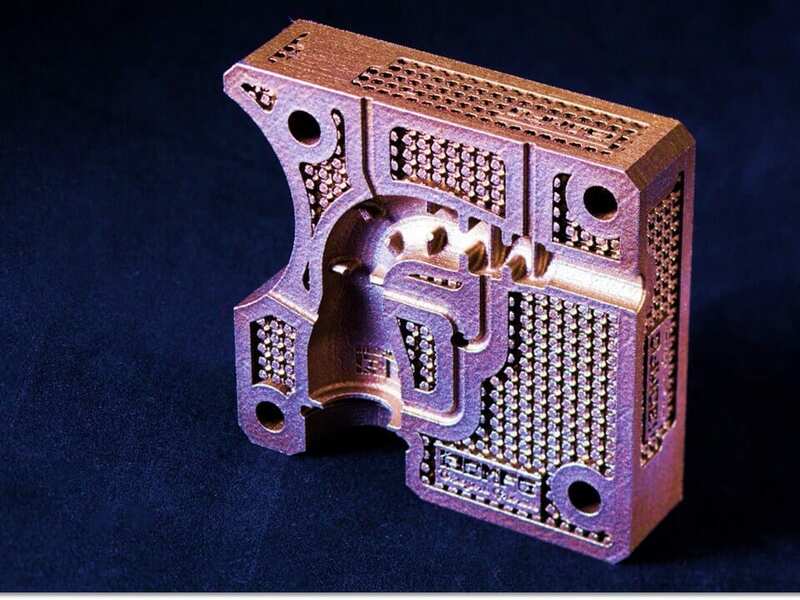 Direct Metal Laser Sintering (DMLS) metal 3D printing cost effectively allows aerospace, oil & gas, and automotive engineers not only to easily manufacture cooling channels, but to produce conformal micro channels that traditional manufacturing cannot achieve. Since DMLS powder is a 6061 Aluminum equivalent, the thermal conductive properties are also well matched. With held tolerance’s off the machine of +/- .004 and a process that builds parts with highly complex internal geometries, compact heat sinks that maximize surface area and air flow are possible. 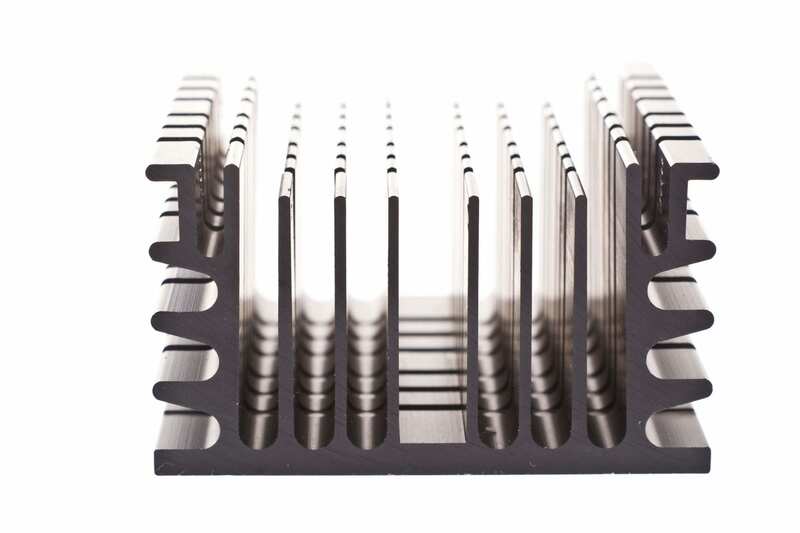 DMLS melts metal powder layers together to nearly 100% density, also making these innovative heat sinks manufacturable using 3D metal printing. i3D MFG™ has produced several successful heat sink projects for a variety of aerospace and UAV companies using our DMLS Aluminum. In addition to the conformal cooling channels and the surface roughness advantages, client can also produce multiple designs on one build for testing and then come back and do production runs on the bets performing design. i3D™ also 3D prints in Titanium, Stainless Steel, Maraging Steel, and Inconel. 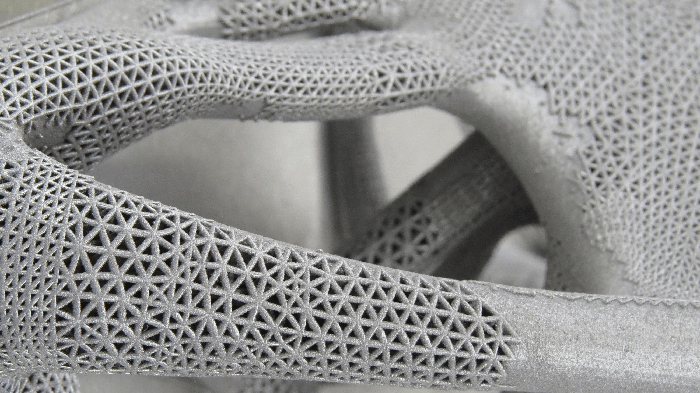 Direct Metal Laser Sintering (DMLS) 3D printing was featured first as an excellent rapid prototyping tool and then as a new manufacturing advancement in two 3D Printing Industry News items over the past two days. So which is it, prototyping or production parts? The fantastic news for designers, engineers, and production managers is that DMLS has been a phenomenal rapid prototyping tool for functional metal parts for years and now it is also a proven metal manufacturing method for complex parts ranging from turbines to heat exchangers. As Scott Grunewald points out in his article, “This (DMLS) rapid prototyping allows newly developed components to be test installed, articulated and checked for clearance and movement tolerances. The final models can then be used to create the drawings and manufacturing guides that define construction materials, inspection requirements and post processing features. 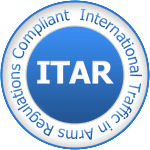 This portion of the process is so fast that the final part is just being completed by the time the approved drawing is released.” Innovations can be tested in working models, using titanium, inconel, tool steel, stainless steel or aluminum and then tweaked and retested in a matter of days. DMLS parts near 100% density, making them comparable or denser than machined or cast parts. 3D metal printing, like other 3D printing methods allows multiple 3D models to be built at the same time without contending with expensive CNC programming time. Aerospace giants like GE and Lockheed Martin have invested in hundreds of DMLS machine to take advantage of this competitive advantage. While GE and other aerospace players have used 3D prototyping for years, they have also increasingly starting using DMLS for production runs. Sigma Components’s news about its funding and partnership with Rolls Royce to utilize DMLS to manufacture complex functional parts for use in end products highlights the untapped potential 3D manufacturing brings to production. DMLS has progressed in its speed and reliability to the point of becoming a viable process for Sigma to “…redesign and develop lightweight pipe end fittings that use 3D printing and additive manufacturing to reduce the weight of traditionally manufactured components and minimise part and manufacturing costs.” However, to achieve its full potential, designers and engineers must shift their perspective to Design-for-3D, eliminating traditional manufacturing design constraints. i3D MFG™ is focused on helping its customers realize these manufacturing advantages. With a full team of 3D engineers, as well as its designation as the EOS Material Process Application partner, we not only offer 3D manufacturing, but new DMLS powder development, parameter development, and of course, rapid prototyping. Why would a new small business opening in The Dalles, Oregon be newsworthy to Aerospace Manufacturing and Design Magazine? Aerospace is big in the Pacific Northwest and the UAV/UAS giant Insitu is located 20 minutes from i3D™ Manufacturing’s Direct Metal Laser Sintering (DMLS) factory. 3D metal printing has emerged as a critical component in aerospace, rocket, and UAV design and manufacturing, but until 2014, there were no Northwest DMLS service providers. Insitu, Boeing, and the like were forced to use services thousands of miles away, reducing some of the lead time and cost advantages 3D printing is known for. Oregon is defined by innovation and i3D™’s 3D printing technology is at the forefront of advanced and additive manufacturing. 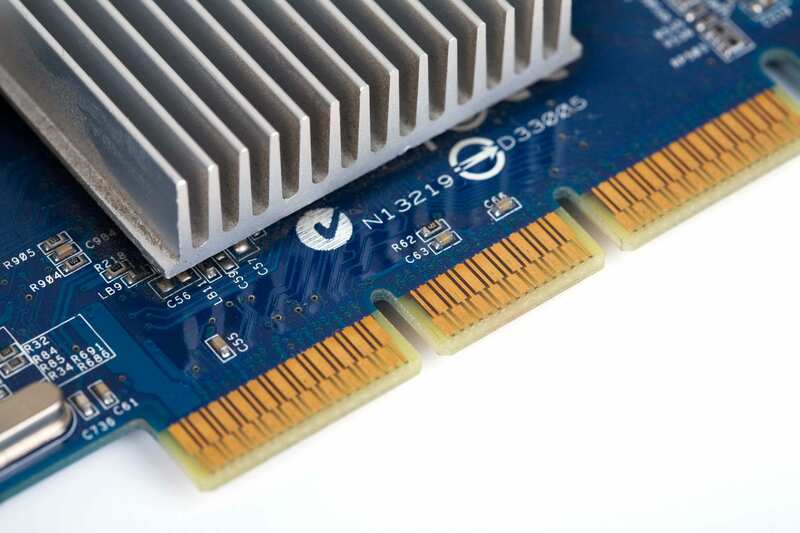 DMLS moves 3D printing from the prototyping realm into true production parts manufacturing. DMLS parts are used in final assemblies by Boeing, Lockheed Martin, GE, etc. In addition to aerospace, i3D™ also provides parts for medical and dental device applications, firearms accessory manufacturers, the energy and recreational gear industries, and automotive parts users. In 2013, manufacturing accounted for 28% of Oregon’s economy, over $65 billion in output. So, its not surprising that the Portland Tribune and Portland Business Journal also featured i3D™ in their Summer 2014 publications. As opposed to traditional, or subtractive manufacturing where parts are carved out of billet, the additive manufacturing process starts with 20-40 micron layers of powdered metal and uses a laser to melt thousands of micro layers together, one layer at a time based on a 3D CAD model – adding material only where the model dictates. The no-waste process enables parts to be built that cannot be traditionally manufactured, including complex geometries, lattice and honeycomb structures, conformal channels, and single part builds of multi-part assemblies. i3D™ prints stock metals including Titanium, Aluminum, Inconel, 15-5 and 17-4 Stainless Steel, and Maraging Tool Steel as well as custom powders created for specific customer applications. The Dalles has a long history of metal manufacturing and gave i3D™ a warm welcome to its community and the Columbia River Gorge region. Both The Dalles Chronicle and Gorge Technology Alliance celebrated i3D™’s headquarters locating in Oregon.